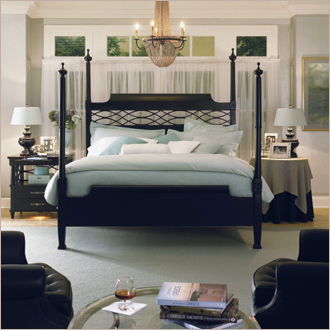 Bedroom pieces include thoughtfully designed features such as adjustable height posts on the headboard and footboard of the beds, built-in nightlight. The sleek bow front with louvered slats adds unique, contemporary styling to the modern conveniences of this console. Espresso finish with nickel wire inlay. Loking drop-front writing surface. 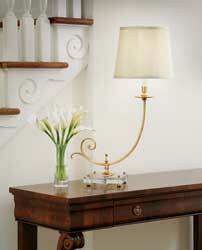 The Celeste Table Lamp combines exquisitely handcrafted antiqued brass with a solid crystal slab base. 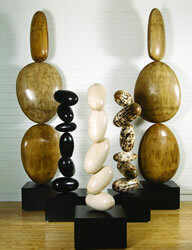 Genuine stone coaxed into smooth, organic shapes reveals the sculptural side of simple. The Pasadena sofa is a style that is chameleon-like. Depending on what color it is covered in, the sofa can be perceived as either sleek contemporary or softer transitional. 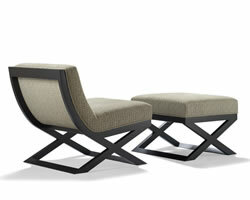 The Teri chair and ottoman are the ultimate marriage between high quality and fine design. Not only swanky and stylish, the unique pair boast comfort and class as well. Made of fine Alder wood and shown in espresso, the frame is also available in five other finishes. Made in America, an expanded version of the Teri collection will follow.